Join Indian Army . 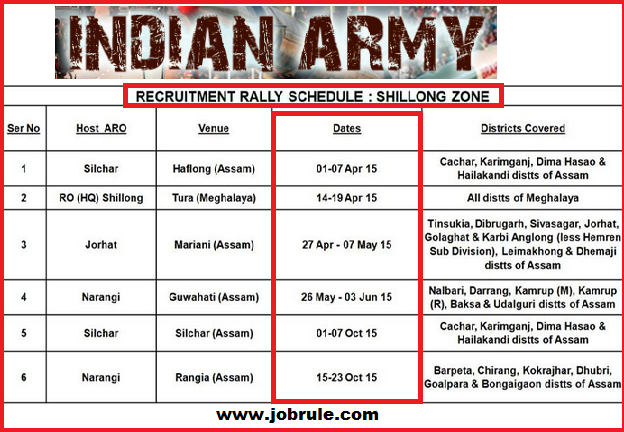 Army Recruiting Office-ARO Agartala under HQ RTG Zone Shillong , going to conduct a open/direct (Online Registration is Mandatory) Army Recruitment Rally at Agartala (Tripura State) from 15/05/2016 to 22/05/2016 to recruits thousand Indian Army Soldier General Duty, Soldier Technical ,Soldier Tradesman, Soldier Clerk/Store Keeper Technical etc trades. Like our Jobrule official Facebook page or browse our website to get all latest news/updates about date & category wise program schedule. Best of luck ! Keep touch with us. 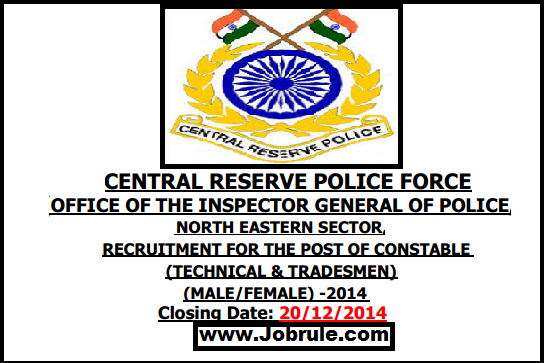 Office of the Inspector General of Police, North Eastern Sector, Central Reserve Police Force-CRPF, Shillong, Meghalaya, invites Application in prescribed format for direct recruitment to the post of ‘Constable (Technical/Tradesman)’ from Male/Female residents of NE States (Arunachal Pradesh, Assam, Manipur, Nagaland, Meghalaya, Mizoram & Tripura) to fill the vacancy in the rank CRPF Constable (Technical/Tradesman) i.e Driver/ Fitter/ Bugler/ Tailor/ Brass Band/ Cobbler etc trades. 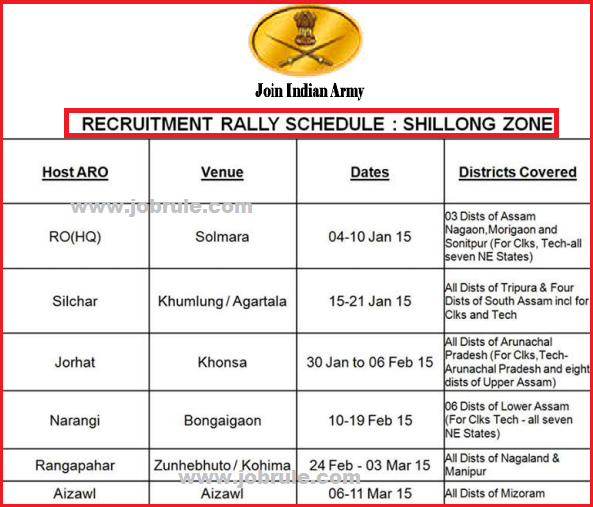 Army Recruiting Offices (ARO- HQ-RO-Shillong, ARO Silchar, ARO-Jorhat, ARO Narangi, ARO-Rangapahar & ARO Aizawl) under HQ RTG Zone Shillong going to organize separate open/direct Army Soldier Selection/Job rallies in North East-NE States to recruits thousands Army Soldier General Duty-GD, Soldier Tradesman, Soldier Technical, Soldier Clerk/Store Keeper (Sol CLK/SKT), Army Nursing Assistant-NA etc. We will notify date wise and district wise schedule/plan, Educational qualification, physical Standards (PST/PET) , Written test pattern/syllabus, result 2015 and many more of every AROs later . So ,you are requested to like our Jobrule Facebook Page to get touch with us always..
Join Indian Air Force and Become an Airmen. Air Force Direct/Open Recruitment Rally in North East States (Tripura & Mizoram) December 2014. 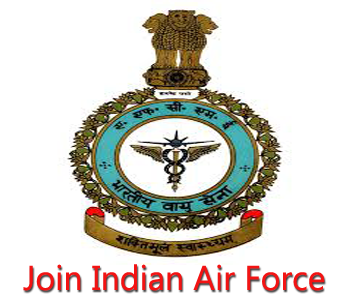 Indian Air Force offers opportunities for Unmarried Male Indian Nationals from all districts of States of Tripura and Mizoram to become an Airmen Group X (Technical) . 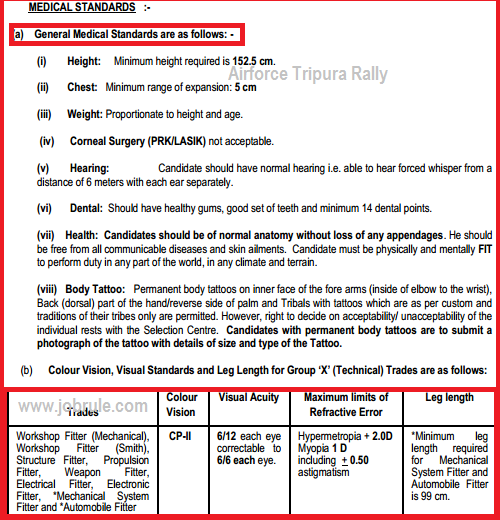 Recruitment Rally for Group X (Technical) Trades at Tripura Sports School, Badharghat, Agartala, Tripura from 7th Decmber (7/12/2014) to 8th December (08/12/2014). The recruitment test will be conducted from 7 A.M onward as per the details given below. 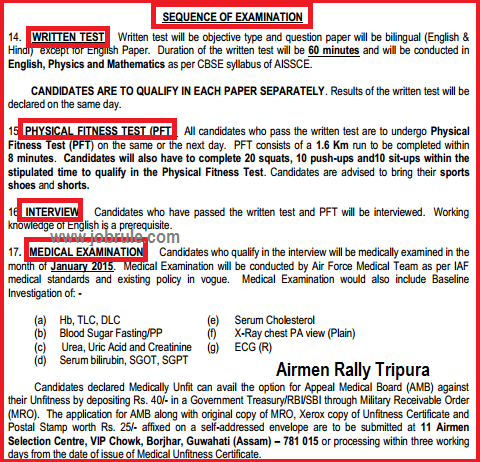 Candidates from respective districts (All districts Tripura & Mizoram) reporting up to 10 A.M on 7th December , 2014 at the Tripura Rally venue will only be permitted to appear in the recruitment test and registration. Remember, the recruitment test is not for the selection of Commissioned officer/Pilots /Navigators . 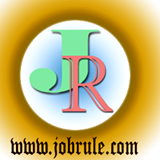 To check details about educational qualification and domicile recruitment, simply go through official advertisement link given at the end of this post.